Jack Arnold Designed Home Goes on Market … Sold! 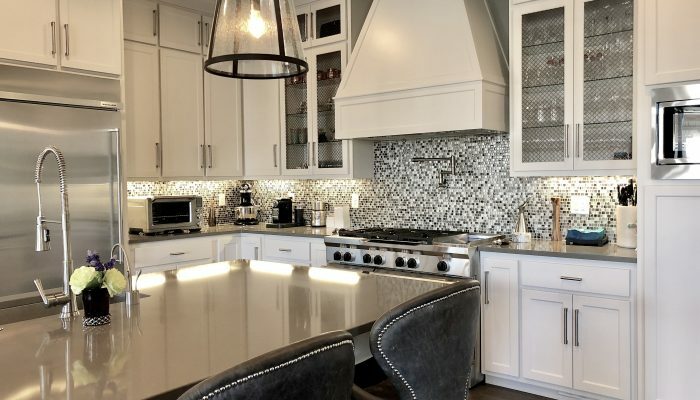 A gorgeous Jack Arnold designed home hit the market today! 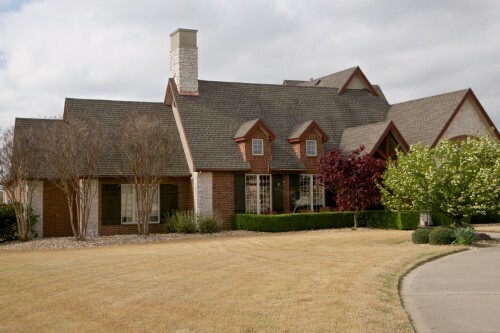 This home is in the popular Stonebriar neighborhood of Bentonville. If you haven’t been out to Stonebriar, it’s a “must see.” It’s off Highway 72 adjacent to Talamore. 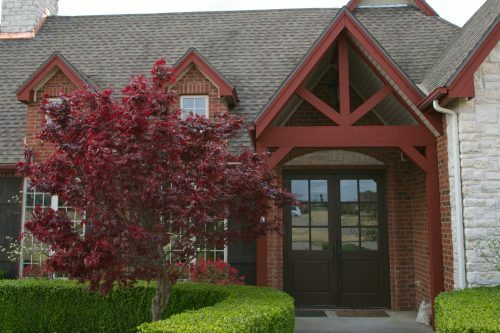 You’ll find some gorgeous homes in this part of Bentonville! This featured home is located at 10900 Hearthstone Lane and it has one of the best floor plans I’ve seen. 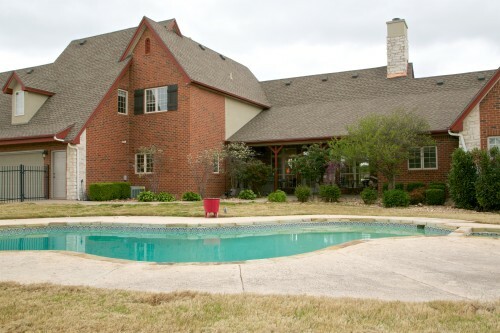 It’s situated on a 1.46 acre corner lot and it has a beautiful pool with a hot tub. 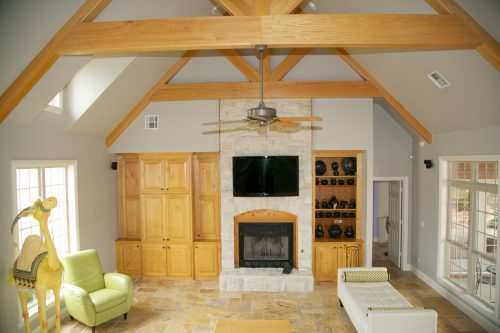 As you enter the front door you’ll immediately see cathedral ceilings with exposed beams. It is truly breathtaking! You’ll want to stand there a moment to take it all in. The home brings in plenty of natural light which adds to the appeal of it. There is a fireplace in the living area as well as in the hearth room. A butler’s pantry connects the hearth room and kitchen to the dining room. The kitchen features high-end stainless steel appliances, including a 5-burner gas stove, double oven, and Bosch dishwasher. There is new flooring throughout the home. 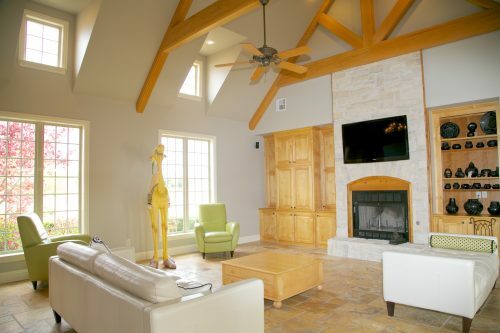 Travertine tile was chosen for the living room and master bedroom. Polished concrete was chosen for the other living spaces. New wood and carpet has been installed upstairs. 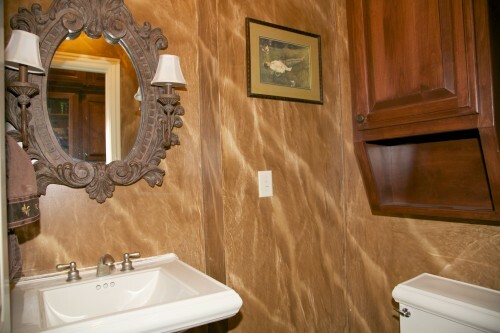 The bathroom counter tops have been upgraded to granite. The house is wired for sound and security. The office off the master bedroom, with access to the back porch, features extensive custom cabinetry. 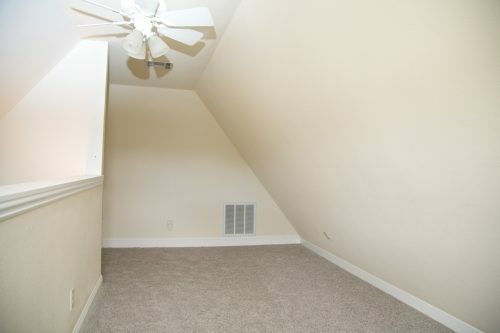 There is a 3rd level loft accessed through one of the upstairs bedrooms that would make a great play room, office, art studio or storage area. 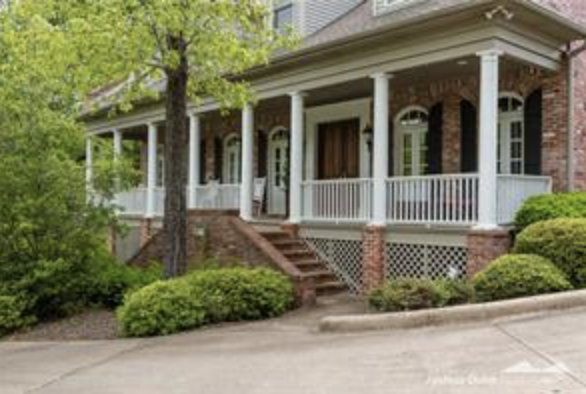 The home has a 4 car garage and is currently zoned for the new Bentonville West High School. Text me today to set up a showing. This one won’t be on the market long! 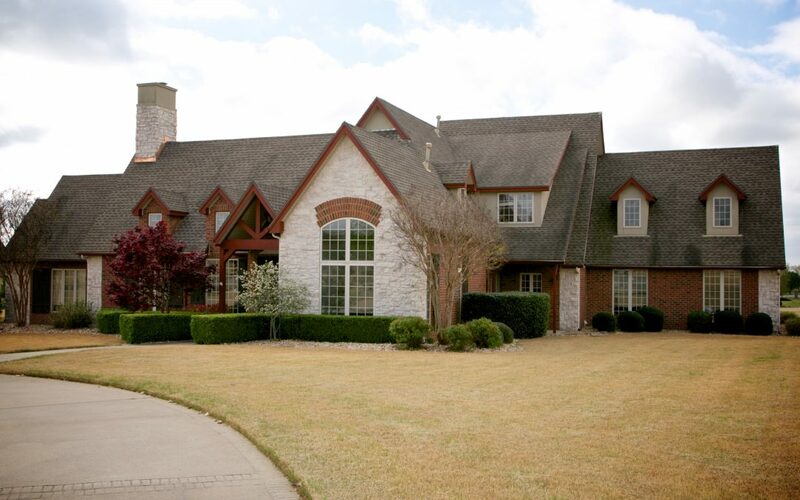 This brick and rock designer home and is situated on a large (1.46 acre) corner lot. A fresh coat of stain on the cedar wood trim and the large wood double front door enhance this home’s beautiful curb appeal! 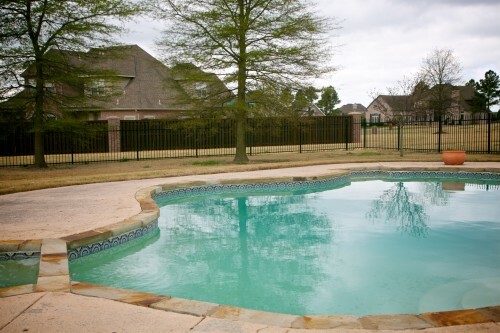 A beautiful backyard pool and hot tub has just been opened for the season and is ready for your enjoyment. Iron fencing surrounds the pool area. 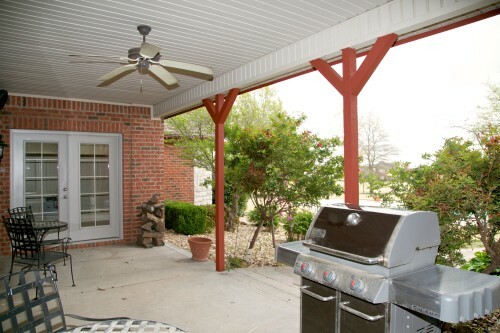 Enjoy relaxing and grilling on the covered porch that overlooks the pool. 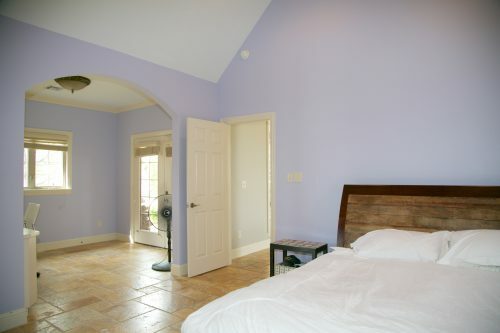 Also access the beautiful backyard from the master bedroom suite. 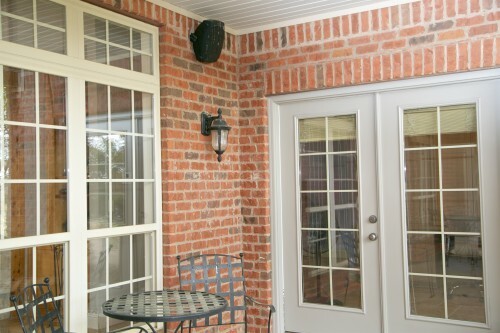 Home is wired for sound inside and out, as well as security. 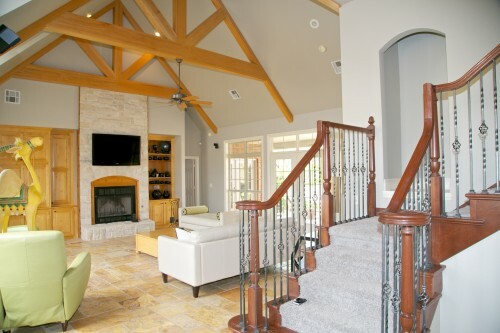 The cathedral ceiling and exposed beams of the living area make for a stunning entry view for you and your guests. 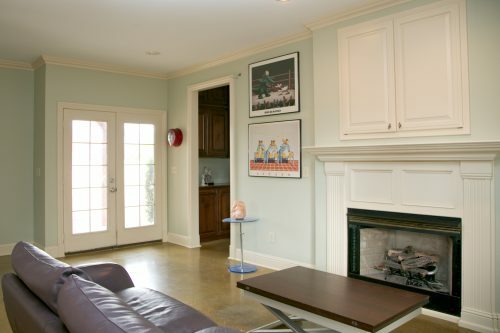 The open living area also features travertine tile, a fireplace, and custom cabinetry. 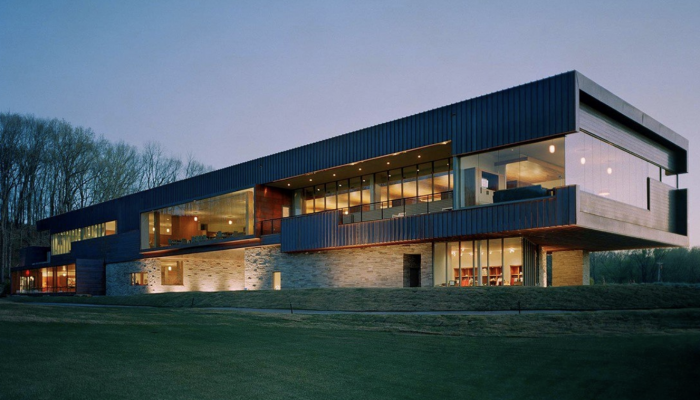 Natural light fills this space through the oversized windows and dormers that line both sides of the living area. 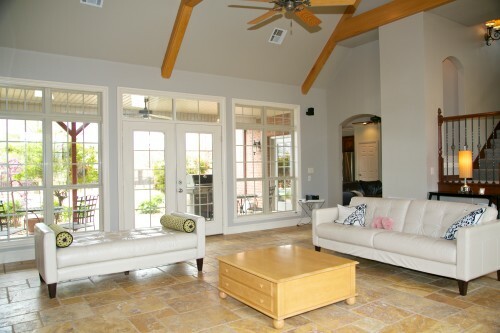 A wall of windows and double french door lead you to the back patio and pool area. The kitchen features high-end stainless steel appliances including a 5-burner gas stove, double oven, microwave, and Bosch dishwasher. 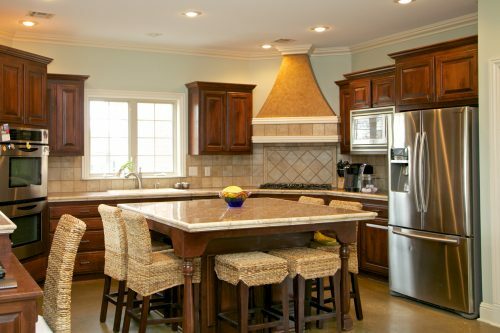 It also features custom cabinets, a large island, a pantry, a desk, and stained concrete flooring. The hearth room is located just off the kitchen and features stained concrete flooring, custom mantel, and gas log fireplace. 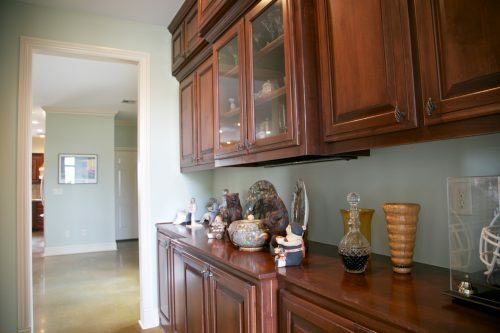 Between the hearth room and the dining room you’ll find a Butler’s pantry, half bath, and a storage closet/pantry. Plus, just off the hearthroom there’s a covered entrance to the side yard. The dining room features a barrel and beam ceiling and oversized windows. Located just off the front entry, it has great functionality by connecting to the hearth room and kitchen via a well appointed butler’s pantry. 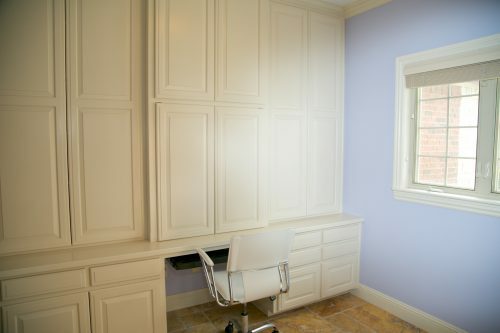 A guest powder room is located privately off the butler’s pantry. 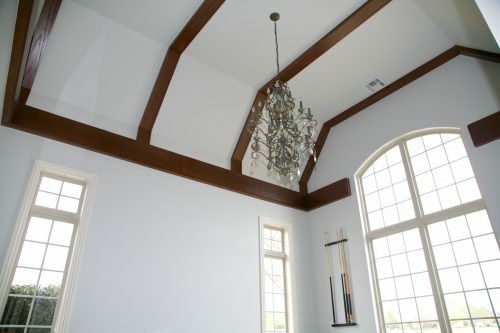 Located on the main level, the master bedroom has it’s own office space, new travertine tile and a cathedral ceiling. This private office space off the master bedroom features custom cabinetry, travertine tile, and plenty of natural light. Plus, it has its own access to the covered back porch. 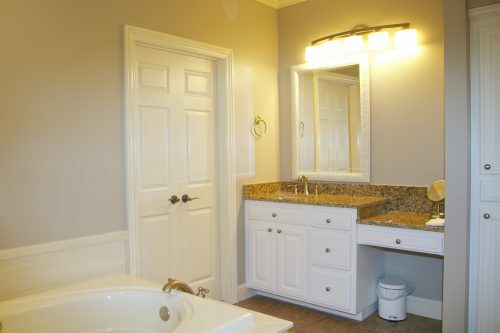 The master bathroom features a vanity, two sinks, whirlpool tub, dual shower heads, additional custom cabinetry, and travertine tile. 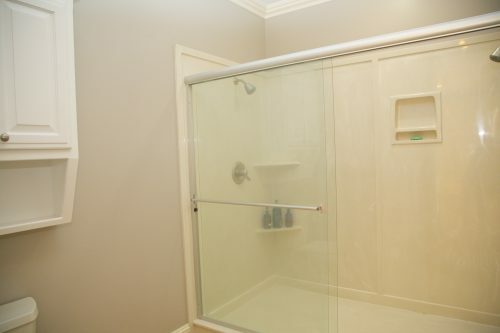 The master bathroom features a large walk-in shower with dual shower heads. 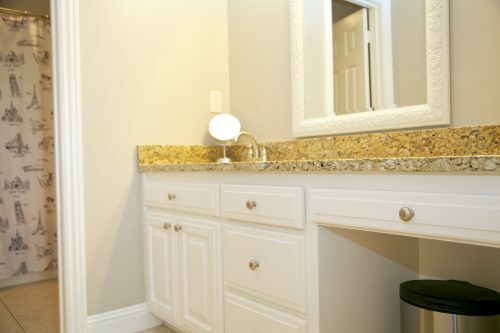 A large walk-in closet can be accessed through the master bathroom. This bedroom shares a bathroom and offers plenty of storage space. This bedroom features a loft space and wood floors. The finished out loft is great for a small study, play space or just extra heated and cooled storage that’s easy to access. 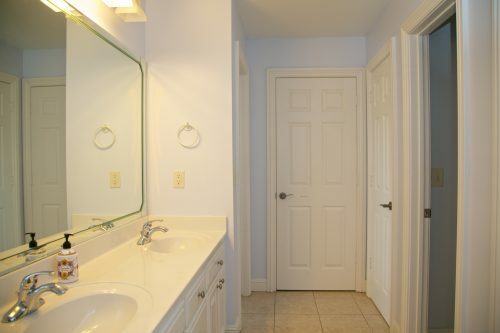 Two upstairs bedrooms share this double vanity bathroom with separate room for tub and toilet. 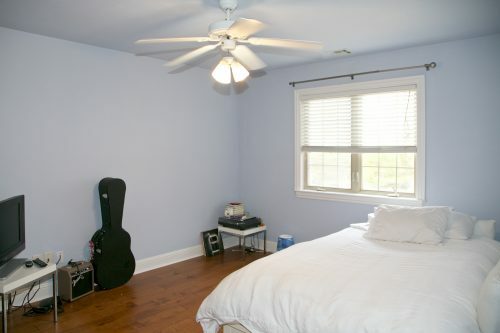 One bedroom has a walk-in closet and the bedroom has three closets. 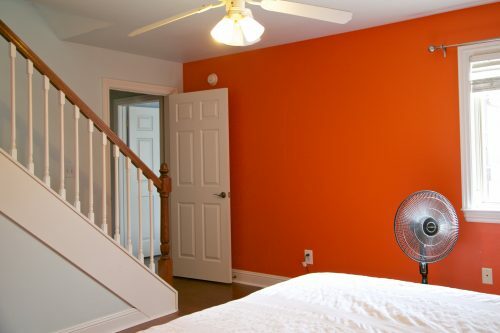 Upstairs find three bedrooms, all with new hardwood floors and lots of closet space. 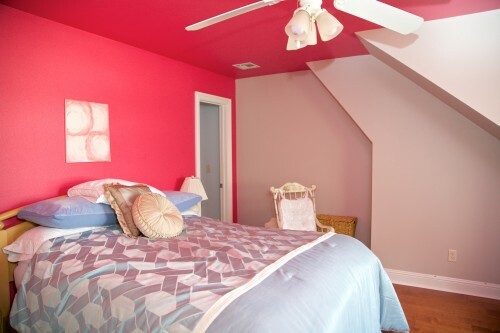 A shared multi-room bathroom can be accessed through this bedroom. 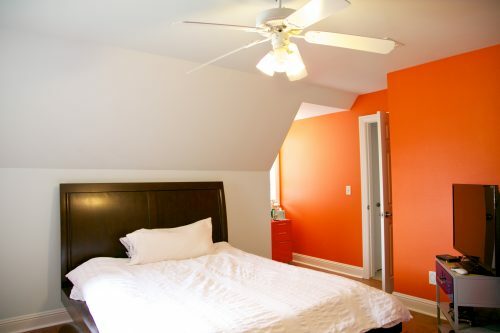 This upstairs bedroom features wood floors and has its own private bathroom with walk-in closet. 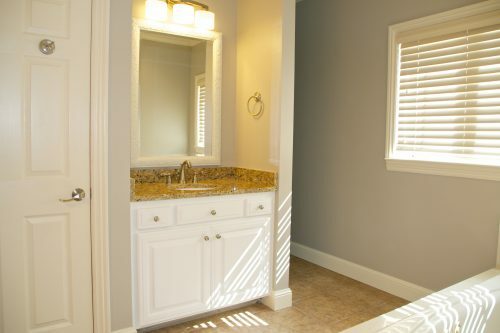 This bathroom features a separate shower area, a vanity, and a walk-in closet. 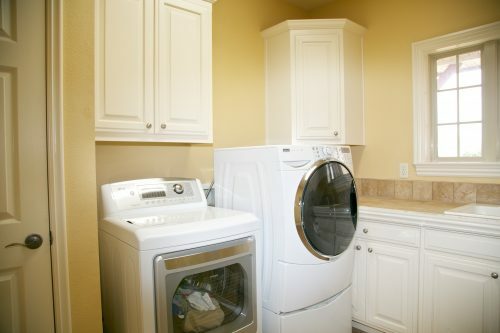 The laundry room is located just off the kitchen and features a storage closet, a sink, custom cabinets, and lots of natural light. Call or text Jill Bell at 479.799.3023 or Cheri Marks at 479.841.0082 for more information or to set up a showing. 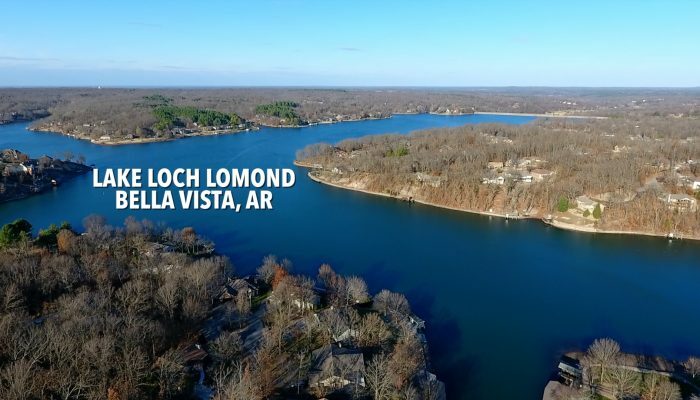 We’d love to help you out if you’re interested in buying or selling real estate in Northwest Arkansas.